ARE YOU TIRED OF PAYING DEALER PRICES? Dynarev is your Audi dealer alternative. We have the knowledge and the tools to fix any problem big or small. No matter where you had your Audi serviced previously; dealer, independent shop, German car specialist or a friend. You cannot beat the value and quality of Dynarev. Call us for a free estimate NOW!! We will beat any reasonable written estimate. Audi is a state of the art vehicle and it only uses the latest technology like most German vehicle manufactures, witch is a good and a bad thing. Good because automotive industry is advancing rapidly when new technology is used, and its a bad because you are usually the test diver, and not all new technology means its reliable technology. That is where our Dynarev Team comes in, we know those cars inside and out, we have all the tools and the knowledge to fix even the newest systems on all the Audis. It takes the latest technology tools and up to date training to maintain such advanced automobiles. Independent shops just don't posses the knowledge or the skills to repair those cars correctly. That is why we specialize in Audi vehicles and all the systems that are on those vehicles. 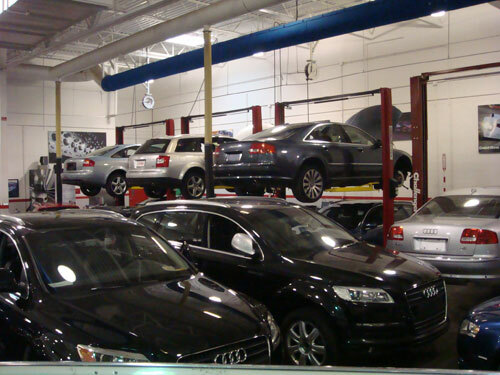 Serving Chicago and Lake County area, our team of technicians is Audi trained and are dealership experienced. To provide the best quality and customer service Dynarev requires all of our technicians to be up to date with ASE certifications. We treat all of our customers like family and keep them 100% satisfied by keeping our prices low and quality high - satisfaction guaranteed. There is no problem that is too hard for us to fix, give us a try, and call for a free estimate. We promise to save you time and money, keep you happy, and your Audi running as it should. Dynarev has the tools, technical knowledge, and experience to fix your Audi correctly the first time.